Black Friday is an exciting time for retail. It kicks off a 1-month period that generally accounts for 30-40% of annual sales for many companies. This year did not disappoint with Adobe Analytics estimating a 24% increase in online sales vs last year, which continues a long term uptrend in online sales coupled with a slow decline in in-store sales. The greater the discounts, the higher the expected site volume; and with great opportunity comes great disappointment if your website can’t deliver on digital demands. In fact, difficulty in deliverability became one of the key themes of this year with high visibility struggles from big names such as J.Crew, Walmart, Ulta, Lowes and even Facebook. 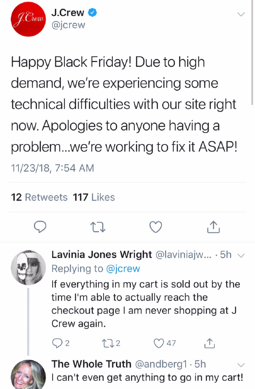 Thanks to social media, these struggles have become mainstream news, with an outage not only impacting the customers trying to purchase, but also becoming noticeable to the general population and potentially further tarnishing brand reputations. Given the many concurrent promotions that are going on, it is important to note that struggles can also come from coupon code issues, not just total site outages - these are often less noticeable and difficult to fix. 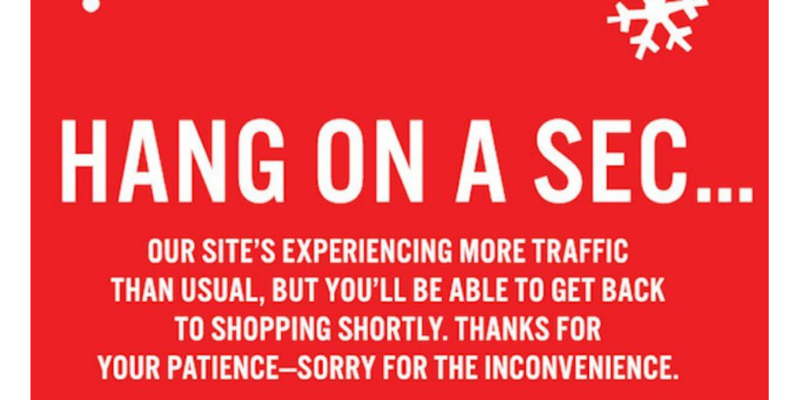 But outages and frustrated customers can be avoided by eRetailers that prioritize digital experience improvement. In fact, Quantum Metric found that eCommerce retailers that invested in user experience optimization were able to efficiently convert traffic, experiencing a year-over-year conversion rate increase of 8.9% for Thanksgiving, Black Friday and Cyber Monday. Prioritize: There will be no shortage of things to do, but you need to use data to figure out what activities will yield the highest benefit in the shortest period of time. This prioritization shouldn't just focus on the most common issues and opportunities, but rather those having the highest revenue potential. Set intelligent alerts: Alerts on key behavioral and technical metrics can proactively identify issues - but this can be difficult because Black Friday traffic looks nothing like a random November Friday, so you need to look at historical trends and ideally use machine learning to weed out false positives. Alerts should be based on technical issues such as 404 or promo errors as well as behavioral ones such as bounce rates or rage clicks. Customer feedback to session replay - Even with all the alerts in the world, your customers are your best early warning indicators on Black Friday, but it can be difficult to know what they really mean when they tell you about how much they want to give you their money and how little your site wanted to accept it. Tying their feedback to a pixel perfect replay of their actual user experience on the site increases its actionability - bonus points if you can filter by NPS to pinpoint detractors. Technical and user experience tie-in - Seeing a conversion drop is one thing, being able to actually solve it is even better. This is why tying the user experience to the actual technical experience served to the customer is critical to moving quickly during high visibility. If a banner is loading slowly or a button is broken, you need to be able to identify that and quickly give your engineering team sufficient info to fix it. The holiday shopping season can be a time of high traffic and high stress. But with the right customer experience methodology in place, brands can see both immediate and long term success. To learn more about optimizing digital experience, read our latest eBook!